Copperstone Cottage, a Perfect Honeymoon Cabin. Copperstone Cottage is a cozy little getaway built for two. It has a whirlpool tub and shower in the bathroom. The Queen size cedar log bed is one of a kind. This cabin has lots of creative details that you just won't find anywhere else. The bathroom vanity is made from a recycled copper tub. The bar top is made of from the back of an antique church pew. The private, covered back deck has an outstanding view of the Meramec river bottom. This sweet little cabin is perfect for a romantic escape from your daily routine. Copperstone Cottage is such a romantic, sweet little cabin. If you need a place to get away for just the two of you, this little cottage is perfect. We love Murphy's place. We have Been here to the Dog Wood Cabin 3 times as a family....twice to the Copperstone Cottage, just me and my husband. Just the best place to disappear, relax and have a great time on the river, downtown Steelville for breakfast or dinner, or just hanging out by a fire. Murphy's is never a disappointment! 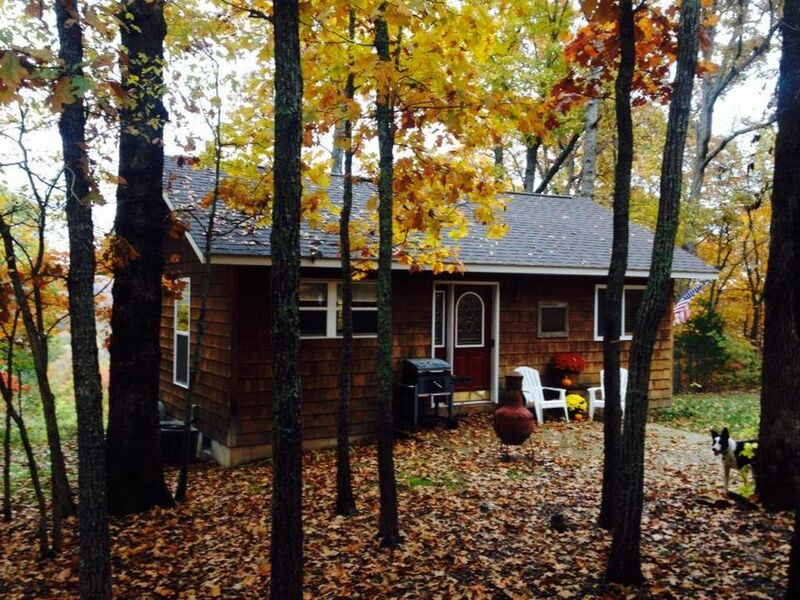 Beautiful cabin on a bluff overlooking a large river bottom and the Meremac River. We really enjoyed the relaxed getaway. Walking down to the river and sitting on the back porch or by fireplace was our favorite parts. We will come again! Great place to stay! We will definitely return. Do not overlook this place, great owners. All the cabins are fully stocked and super clean. Look no further. Spectacular views from this 5-star cottage. Beautiful views high above a scenic farm land shared grounds with the waters of Meramac. Every square inch, this cottage is well built & decorated. Look no further. Grounds are A-1. Cottage 5-star. Family's pride is multi generations... and provides a cottage stay at home hospitality. The pictures on the website don't do it justice. Beautiful property, amazing views. The owners were very nice and helpful. My husband, pup and I set out to escape the city. Murphys place exceeded our expectations. Cabin made by the owner was romantic, clean and comfortable. 5 mile float was convenient as the float ended at our cabin. We didn't want to leave! Do not use Google Maps to find us. You will get lost. Please use the directions I will email to you.